Tom Wolfe (The Right Stuff, 1979), Gay Talese (Thy Neighbor’s Wife, 1980), and Hunter S. Thompson (The Curse of Lono, 1983) still use fiction techniques in their nonfiction books. But younger writers in Esquire and Rolling Stone magazines, where the style flourished in the ‘60s and early ‘70s, have shifted away from what was called the New Journalism. Fiction techniques have not been abandoned by these writers, but they are being used sparingly and less flamboyantly. Others blamed the absence of talented writers. William Zinsser, author of On Writing Well and a number of non-New Journalism magazine articles, said that “sloppy” Wolfe-imitators wore out the New Journalism’s welcome. Adam Moss, an associate editor at Esquire, said that during the ‘70s magazine journalism became unfashionable among many of the more capable writers, who found that there was more money to be made from novels and screenplays. Thompson’s editor, Rolling Stone publisher Jann Wenner, disagreed. He said that there are few events or personalities in the ‘80s that lend themselves to New Journalism treatments. “There’s not much that writers like Tom Wolfe or Hunter really want to write 20,000 words about anymore, or 10,000 words,” he said, “and there aren’t many subjects that the reader wants to read about.” Others, including Wolfe, argued that there will always be plenty of subject matter for would-be New Journalists who bother to look for it. The New Journalism, as defined by Wolfe, applied to factual reporting four narrative devices used mainly in fiction: scene-setting, dialogue, status detail, and point-of-view. The style appealed to writers, many of them novelists or would-be novelists, who felt constrained by traditional magazine nonfiction. 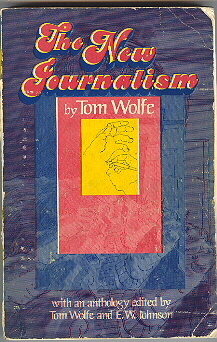 Wolfe’s 1973 anthology, The New Journalism, included nonfiction by Talese, Thompson, Norman Mailer, Truman Capote, Joan Didion, Michael Herr, and George Plimpton, among others. These writers had distinctive styles and emerged independently of one another, but Wolfe said that they each used the New Journalism’s characteristic devices to write nonfiction as “absorbing” and “gripping” as novels and short stories. ”Hi, sweetheart!” Joe Louis called to his wife, spotting her waiting for him at the Los Angeles airport. She smiled, walked toward him, and was about to stretch up on her toes and kiss him – but suddenly stopped. When the Louis combinations began to land, Rose went, “Mummmm, mummmm,”and then the pale body of Conn began to collapse against the canvas. Billy Conn slowly began to rise. The referee counted over him. Conn had one leg up, then two, then was standing – but the referee forced him back. It was too late. But Rose’s husband in the back of the room disagreed. Rose Morgan said nothing – just swallowed the rest of her drink. Talese has since described the Louis piece as an early effort to bring the tone of Irwin Shaw and John O’Hara short stories to factual reporting. Between the opening and closing scenes, most of the Louis piece read like a conventional magazine profile. But Talese increased his use of fiction-like scenes in subsequent articles for Esquire. In the mid-1960s, Talese switched to lengthier projects: The Kingdom and the Power, which profiled his former employer, the New York Times; Honor Thy Father, which profiled the Bonanno Mafia family; and Thy Neighbor’s Wife, which explored changing sexual mores. Wolfe’s first New Journalism piece was “The Kandy-Kolored Tangerine-Flake Streamline Baby,” which ran in Esquire in 1963. He wrote it in stream-of-consciousness fashion. The ramble on custom car collecting, unconventional as its title, was written as a memo to Esquire’s then-managing editor, Byron Dobell, after Wolfe failed to produced a conventional piece on deadline. Wolfe, who had earned a Ph.D. in American studies at Yale and reported for the Washington Post before becoming a New York Herald Tribune reporter, continued developing his New Journalism in numerous articles for Esquire and the Herald Tribune’s Sunday supplement, which later became New York magazine. Many of these articles are collected in his books The Kandy-Kolored Tangerine-Flake Streamline Baby and The Pump House Gane Like Talese, Wolfe later switched to book-length New Journalism: The Electric Kool-Aid Acid Test, an account of novelist Ken Kesey’s LSD-influenced lifestyle; Radical Chic Mau-mauing the Flak Catchers, humorous looks at two racial confrontations; and The Right Stuff, an account of the early days of America’s space program. The New Journalism was first called by that name in the mid-1960s. Seymour Krim, an author and writing instructor at Columbia University, said that the term was coined by Pete Hamill in 1965. During a newspaper strike that year, Hamill, then a New York Post columnist, phoned Krim about doing an article called “The New Journalism,” which would have been about Wolfe, Talese, and Jimmy Breslin, a New York Herald Tribune columnist and New York contributor. The magazine Krim edited, Nugget, folded before the article ran, but Hamill’s name stuck. The New Journalism’s rise was spurred by the publication of Truman Capote’s In Cold Blood in 1965, which first appeared in The New Yorker the same year. Capote’s “nonfiction novel” was a factual account of the murder of a Kansas farm family and the capture and execution of the two drifters who murdered them, based on exhaustive interviews with people involved in the case, including the two murderers. The book’s critical success, coupled with the decision of an established novelist like Capote to write nonfiction, lent prestige to the New Journalism. It was also in 1965 that Carey McWilliams, the editor of The Nation, offered an obscure, San Francisco-based freelancer $100 to do a piece on outlaw motorcycle gangs in California. Hunter Thompson, whose previous writing consisted largely of two unpublished novels and some South American correspondence for the National Observer, accepted the assignment, which led to his book Hell’s Angels. The book was based on more than a year of close association with the Angels, which ended with Thompson being badly beaten by a group of them. In Hell’s Angels Thompson describes a number of scenes in which he participated. Later, Thompson increasingly used himself as a character, injecting drug-inspired humor and creating a unique style he called “gonzo journalism.” His first gonzo effort was “The Kentucky Derby Is Decadent and Depraved,” a wildly impressionistic look at the 1970 Derby for Scanlan’s Monthly, which centered on the problems Thompson and artist Ralph Steadman had covering the story. Thompson’s best-known book, Fear and Loathing in Las Vegas, was first published in Rolling Stone in 1971. Vegas is a semi-fictional account of Thompson and his attorney abusing drugs in Las Vegas, where Thompson had been sent to cover a motorcycle race. The book’s manic humor earned it favorable reviews, and Thompson continued his drug-inspired humor in his subsequent writing for Rolling Stone, including what became his 1972 presidential campaign book, Fear and Loathing on the Campaign Trail ’72. By this time I was having a hard time keeping a straight face. These poor, ignorant young waterheads. Would they pass this weird revelation on to their parents when they got home to Middletown, Shaker Heights, and Orange County? Probably so, I thought. And then their parents would write letters to NBC, saying that they’d learned from reliable sources that Chancellor was addicted to LSD-25 – supplied to him in great quantities, no doubt, by Communist agents – and demanding that he be jerked off the air immediately and locked up. Norman Mailer, like Thompson, cast himself as a central character in his political reporting for Harper’s Magazine, later published in his 1968 books The Armies of the Night , a Pulitzer Prize-winning account of his participation, with Dwight Macdonald and the poet Robert Lowell, in the 1967 march on the Pentagon; and Miami and the Siege of Chicago, an account of the 1968 presidential conventions. Mailer won a second Pulitzer, this time in fiction, for his 1979 book The Executioner’s Song. Mailer called this book fiction, despite, as he wrote in its afterword, its doing “its best to be a factual account of the activities of Gary Gilmore and the men and women associated with him in the period from April 9, 1976, when he was released from the United States Penitentiary at Marion, Illinois, until his execution a little more than nine months later in Utah State Prison. Clay Felker said that the New Journalism responded to Esquire’s need to compete with the immediacy of television and newspapers. It found writers who could bring verve and style to their treatment of dated events. To obtain its unique coverage, the magazine turned to novelists, or writers who wrote like novelists. The results included Vietnam reporting by Michael Herr and John Sack; an account of Martin Luther King’s funeral by Garry Wills; and a series of four impressionistic pieces on the 1968 Democratic convention in Chicago by Sack and novelists Terry Southern, Jean Genet, and William S. Burroughs. The desire to cover breaking news in monthly publications was not the only reason for the New Journalism’s rise. Wolfe said that increased affluence resulted in bizarre lifestyles – like California surfers, stock car racers, and custom car collectors – that he often explored in his articles. The ’60s was also a time of artistic experimentation, particularly in popular music. In jazz, John Coltrane and Ornette Coleman pushed toward dissonance and atonality at the same time Miles Davis and John McLaughlin were fusing jazz and rock. Rock also changed dramatically in the ’60s, when drugs and politics affected the music of people like Bob Dylan, the Beatles, the Rolling Stones, and Jimi Hendrix. It was the rock culture that gave rise in 1967 to Rolling Stone. Much of Hunter Thompson’s writing was done for that magazine, which also featured the work of young, New Journalism-influenced writers like Timothy Crouse, Tim Cahill, and Joe Eszterhas. In 1971 the magazine won a National Magazine Award, and in 1973 Rolling Stone published Tom Wolfe’s series of articles about the space program, which led to his astronaut book, The Right Stuff. Some writers took shortcuts to their pursuit of “good reads,” undermining the New Journalism’s credibility. Gail Sheehy, for example, who has since written the best-sellers Passages and Pathfinders, said that her 1971 New York article “Redpants and Sugarman” featured a prostitute that was actually based on a “composite” of several women. More recently, Janet Cooke was fired from the Washington Post in 1981 for fabricating her Pulitzer Prize-winning feature story about an eight-year-old heroin addict. The boy, it turned out, never existed. A month later, Michael Daly resigned as a columnist for the New York Daily News after admitting that the name of his source for a story about a teenager being wounded by a British soldier during fighting in Northern Ireland was a pseudonym. Several other details in Daly’s story proved inaccurate, including the boy’s name and age, and the story gave the false impression that Daly had witnessed the shooting. Not every New Journalist was “a hell of a writer.” Self-indulgent writing was another abuse that gave New Journalism a bad name. Not many writers are talented enough to write New Journalism well, but that did not keep a number of bad writers from trying. William Zinsser said that the proliferation of unskilled Wolfe and Mailer imitators produced “sloppy” writing, “killing the goose” for the New Journalism. Keit3h Childs (exactly like he signs his name – the three is silent), alias Studebaker Hoch of the Frank Zappa recording, confronted the two singers. Neither one of them wanted to supplement Keit3th’s personal lunch fund. “Sure you can reach Duluth with only 10 cents?” asked Duck. Interested in Part 2? E-mail bill@​billbeuttler.com, and he will e-mail you a copy of it.